New construction and expanding redevelopment opportunities – coupled with public and private investment in workforce development – kept the region humming throughout 2018. Experts in Beloit, Freeport and Rockford sound off on the major projects and big ideas driving their economies right now. In 2018, businesses, investors and communities throughout northern Illinois and southern Wisconsin continued to capitalize on a strong economy – a trend that is so far continuing into the new year. Because of a wealth of new construction, expanding facilities, and redevelopment of existing properties, experts agree that local, national, and international businesses are actively investing – and re-investing – in our region and its people. That kind of activity builds on itself as it sparks interest from companies outside the area. While nearby cities often compete to land major projects, our local economic leaders know the region’s overall economy is interconnected, which is why so many continue looking for opportunities to work together in attracting new business. That type of teamwork is underscored by PBC Linear’s decision to remain in South Beloit, Ill., and invest millions of dollars in a 66,000-square-foot facility. Beloit and Rockford both list that project in their “win” columns. Nathan Bryant, president and CEO of Rockford Area Economic Development Council (RAEDC) says it’s also important to look beyond the local economy to see how the global economy is performing, since area manufacturers supply parts to, and do business with, corporations around the globe. “How can we be more intentional about making our connections to the world? We’re in a global economy and need to continue to press forward in making those global connections,” Bryant says. He explains that Rockford does it best by leveraging its strengths – including its heritage in manufacturing, advancements in workforce development, and quality-of-life advantages like affordable living and proximity to Chicago. “We leverage the fact that our region expedites business investment,” Bryant says. 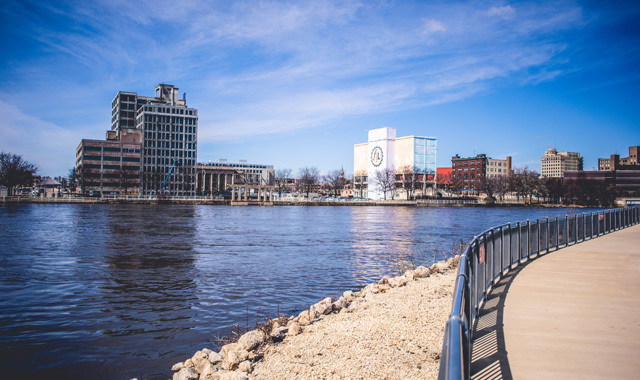 Beloit’s economic development director, Andrew Janke, describes 2018 as “a pretty remarkable year,” for the Wisconsin city with a population of roughly 37,000. That includes the construction of the 84,816-square-foot Holiday Inn Express, The Home2 Suites by Hilton, and the $5.2 million Hotel Goodwin redevelopment. The Hotel Goodwin and its companion piece, the Velvet Buffalo Café, are located in downtown Beloit, which Janke says has a remarkably low vacancy rate these days. “Just down the street from there we had two other restaurants open up – the Blue Collar Café and Truk’t Street Tacos. Those smaller-type redevelopment activities were very significant for our downtown,” Janke says. G5 Brewing – a microbrewery, restaurant and bar set to open this spring in the Gateway Business Park – promises to be another big draw for both locals and visitors who want to enjoy a night out. “It’s a robust economy. There’s more disposable income available, there’s more money to be invested in the community – it’s a win-win across the board,” Janke says. Among Beloit’s many highlights is the ongoing $38.1 million renovation of Ironworks Campus. The structure is steadily being turned into a state-of-the-art, mixed-use facility and it will soon house the Kerry Connect program along with expansions of Ebates, First National Bank, IronTek, and more. Current and upcoming projects he’s excited about include The Powerhouse – Beloit College’s $38 million adaptive re-use renovation of the former Blackhawk Generating Station – and the 200 West Grand Avenue project – a $12 million conversion of the former Kerry manufacturing building into 72 luxury apartments in downtown Beloit. While Janke remains hopeful that plans to bring a casino to Beloit will eventually be approved, he’s already pleased with the economic growth seen in 2018 and forecast for 2019. Since forming in mid-2018, The Greater Freeport Partnership – which unites the Northwest Illinois Development Alliance, the Freeport Downtown Development Foundation, the Freeport Area Chamber of Commerce, and the Freeport/Stephenson County Convention and Visitors Bureau/Visitors Center under a single banner – has focused on becoming a one-stop shop for economic development, tourism and the promotion of all of Stephenson County’s assets. In just the city of Freeport (population, 24,000), 20 building permits reflected more than $2.8 million of investment, Motley says. Countywide, she says, investments totaling $38.5 million encompassed 240,000 square feet of business expansion and the creation of 313 new jobs. As the new organization ramped up last year, its leaders quickly realized the quality of life in Stephenson County had long been underpromoted. So, one of their top priorities has been getting the word out about the advantages of living in, working in, and visiting the area. “We have a real opportunity in this summer season to draw more tourists here to enjoy our breweries, wineries, and outdoor amenities, festivals and events. So, I’m expecting to see an uptick in visitors, which will help grow our local businesses and fill up our hotels,” Motley says. Honeywell’s opening of Plant No. 4 in Freeport has been a boon for the entire area, Motley says, and The Greater Freeport Partnership is actively helping Honeywell to find skilled workers for the positions it needs to fill. Workforce development is the key to making that happen. Motley says local companies have been eager to collaborate with The Greater Freeport Partnership and area schools on ways to better prepare the local workforce. Small businesses also play a significant role in Stephenson County’s economic growth, especially around downtown Freeport, where activity is picking up. “Long term, there are redevelopment opportunities within the city of Freeport in particular – some vacant land, some buildings to be revitalized – at a lower cost, possibly, than in other parts of the state,” she says. No matter how you measure it, 2018 was a record-breaker when it comes to economic development in Rockford, a city with a population hovering right around 147,000. Not exciting enough? Bryant is just getting started. Those figures are even mere astounding considering they don’t include the economic impact of the new Mercyhealth Javon Bea Hospital and Physician Clinic-Riverside, which Bryant says was counted the year the project began. Bryant notes that those square-footage figures include expansion projects, not just new construction. The aerospace and fasteners industries continue to drive the local economy. Outside of manufacturing, Rockford’s downtown redevelopment is having a positive impact on the local economy. Not only is it luring new businesses to town, but it’s attracting residents and visitors alike to spend money on local retailers and restaurants. “All of the work the city of Rockford has done downtown is absolutely invaluable, because you have to have an environment that is going to be attracting young talent, keeping young talent, and giving them an atmosphere where they can have an experience to enjoy,” Bryant says. Events like Rockford City Market and Stroll on State, as well as gatherings like Anderson Japanese Garden’s Tuesday Evening in the Garden and Prairie Street Brewing Co.’s Dinner on the Dock are attracting people, and their money, to locally owned business, while simultaneously adding to the quality of life – which is something businesses consider before investing in any community. Ask any local economic development expert what one of the biggest issues facing our area is right now and chances are they’ll have the same answer. Communities, colleges and universities, and even public schools are working with employers to create and provide educational opportunities that will ensure area businesses will have a large talent pool of well-trained candidates ready to fill positions as they arise. She says Freeport-based CareerTEC – Career and Technical Education Consortium – is collaborating with high schools to provide vocational training in health care, manufacturing and automotive technology. “High school students can explore those careers and even get certifications in some areas,” she says. It’s a similar story in Rockford, where Rock Valley College is promoting the creation of educational pathways while partnering with its nearby public schools and institutions like Highland Community College. Janke, Motley and Bryant agree that investing in workforce development is imperative to the continued economic growth in our region. She says that allowing companies to participate in these types of programs gives them a chance to influence what skills the next generation of workers are being taught. Bryant says he can’t point to any singular cause behind the region’s recent economic boom because many factors are involved. “We’re succeeding, in many ways, because of the fact that we do a lot of these things very well: We do workforce development very well. We’re tied into markets that are global in nature,” Bryant says. This entry was posted on Tuesday, April 9th, 2019 at 12:00 pm	and is filed under Annual Guide, Northwest Business Magazine, Top Posts. You can follow any responses to this entry through the RSS 2.0 feed. Both comments and pings are currently closed.